Yuma City Hall is located at One City Plaza, Yuma, AZ 85364; phone: 928-373-5000. Photo: Henry Levy House, ca. 1916, 602 2nd Avenue, Yuma, AZ. Listed on the National Register of Historic Places in 1982. Photographed by User:Cbl62 (own work), 2014, [cc-by-3.0 (creativecommons.org/licenses/by/3.0)], via Wikimedia Commons, accessed January, 2015. Fort Yuma, California is one of the few remaining properties from Yuma's first major period of significance. That period began in 1850 and ended about 1900. During that half century Yuma achieved prominence as a transportation center, both as a place to cross the Colorado and as a distribution and collection point, for communities either inland or upriver. Initially the settlement consisted of jacal or unplastered adobe structures, each set in its own fenced enclave. The buildings were low and with few exceptions had flat roofs. They were loosely clustered in an area generally bounded by Madison (Brinley) Avenue, 3rd Street, the Gila Slough, and the Colorado River. From 1862 to 1878 Jaeger's ferry, at the foot of Main Street, was the center of commercial activity. By the turn of the century development extended from the Colorado south to 5th Street, and from the Gila west to 1st Avenue. Main Street, lined by one and two story buildings, was still the locus of business activity, but its center of gravity had been moved from the river to 1st Street. Residences were no longer enclosed by adobe walls or fences made from native materials. A few of the early adobes remained (often in remodeled form) but the general pattern of building was more finished and substantial. Brick and wood frame were common construction materials; roofs were typically gabled. Almost all of the buildings from this period are gone: destroyed by floods or cleared to make room for more contemporary facilities. Those properties which do remain have all been transformed to some extent. Furthermore, they are concentrated in one of two locations: either along the Colorado or on the west side of Madison (Brinley) Avenue. The properties along the river are all within the area designated as the Yuma Crossing and Associated Sites National Historic Landmark. Buildings on Madison (Brinley) Avenue are included in the Brinley Avenue Historic District. The second period of significance in Yuma's history began about 1900 and extended at least through 1930. During these three decades Yuma came to be recognized around the world as a model for agricultural development in arid regions. Stimulated by this new economic source the community pushed out of its little valley up onto the mesa. Orange Avenue and 2nd Avenue below 5th Street became prestigious residential locations, 2nd Avenue north of 2nd Street became the governmental center, and 5th Avenue south of Fourth Street became the setting for most of the community's new schools. After the flood of 1916 washed away the last of the adobe: buildings and a new protective levee was built to the east of the commercial district, even that area took on new character and boundaries: Jones Street to 4th Street, and Madison (Brinley) Avenue to Gila Street. The buildings built during Yuma's agricultural boom are, for the most part, similar to development elsewhere in the southwest. Residences and institutional facilities are set individually on their own parcel of land and each is surrounded by a landscape of grass and trees. Commercial structures, on the other hand, are usually built flush with front and side property lines so that a continuous massing results. In general these business blocks exhibit a minimum of stylistic influence. They are simply shells of brick, steel, wood frame, and concrete with a few ornamental details applied to the front facade. However, there are three basic types into which commercial development can be divided: (a) brick structures with wood porches, corbeled brick cornices, and elaborate facade features such as turrets; (b) brick and shell or concrete structures with metal canopies, pressed metal cornices, and facade articulation of the structural frame, and (c) concrete or brick structures plastered white, with semi-circular arched arcades and tile trim on the parapets. The first type is a derivation of 19th century styles such as Victorian, Italianate and Romanesque Revival; the second type is overtly Commercial with touches of Classical Revival influence; and the third is a manifestation of Mission and/or Spanish Colonial Revival influence. Residential design was affected by the same complex of styles used by businesses, with the exception of the Commercial Style and the addition of a few others. Three types of residential development are particularly noteworthy: (a) homes built of precast concrete block with rusticated faces; (b) residences built in the bungalow tradition, and (c) multi-family or apartment structures. The rusticated block appeared in 1905 and was used predominantly for residential work. Houses using the block are characteristically free of eclectic influence and, although simple in shape, tend to accommodate functional requirements over formal ones. Bungalow houses continue this "modern" tendency and take many shapes: from simple, symmetrical units to complex, asymmetrical configurations. The multiple family and apartment structures were a significant building category in a community with a highly mobile population (railroad men, reclamation project crews, and health seekers). They were built in many sizes, configurations and with a range of attention to style. By contrast, public and semi-public facilities were, for the most part, carefully designed in accordance with stylistic conventions. 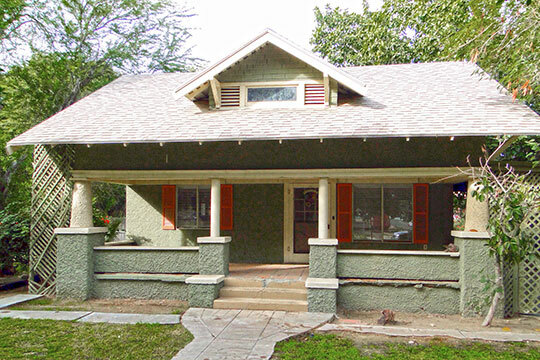 Neo-Classical, Mission Style, and Spanish Colonial Revival are the most common eclectic models which were used in Yuma. Most of these structures are large, multi-storied, and have prominent sites. Because of the high quality of their workmanship and materials many of these buildings have continued to fulfill community needs with minimum alteration to their original fabric. It should be noted that during the 1930s several semi-public and commercial projects were built in the Art Deco Style. These are among the most interesting of the community's architectural heritage. Billy G. Garrett, Janus Design, Yuma Multiple Resource Area, nomination document, 1979, National Park Service, National Register of Historic Places, Washington, D.C.